Sculpting flame for an action figure isn't easy. After all, how do you make a solid 3D representation of something that has neither form nor shape? It hasn't stopped toy companies from trying, though some efforts work out better than others. To say that Johnny Storm was a brat when he first got his powers would be a bit of an understatement. Hot-tempered and often petulant, he took every opportunity to provoke Ben, and often flew off on his own after being scolded by Sue or Reed. He's grown over the years into a good man, with a keen sense of responsibility and a healthy respect for the power he wields. Capable of emitting a burst of flame intense enough to level entire city blocks, he is constantly aware of himself and his surroundings when using his powers. Even so, his maturity has not completely obscured his wild streak, and he is the public face of the Fantastic Four - possibly the first true celebrity super hero. He is perhaps more often seen pulling up to a gala social event in one of his custom roadsters than he is battling crime. Johnny has had almost as many figures as his friend Ben Grimm, the ever-lovin' blue-eyed Thing. Still, it's nice to finally see a version that doesn't have some built-in action feature besides plentiful articulation, and isn't based off the Spider-Man Classics Daredevil body. This figure represents the Torch in the midst of flaming on, so what we get is a plain guy in a Fantastic Four uniform with a few translucent flame pieces glued on. Which, yes, is something we've had before, it's still handled nicely. For the most part. Though the Torch's new sculpt is thin like the old DD body, it's a new piece. It somewhat resembles the body introduced for Bullseye, but it's not as wide across the shoulders, and lacks some of the joints. No, this is a a new sculpt, designed just for Johnny. The 4 emblem on his chest is even a sculpted element. His boots are bunched at the ankles, indicating that he doesn't quite care about how his uniform fits. If you wanted to, you could easily remove the orange flames from his boots, gloves and chest, but you'd have to fill in some gaps if you wanted to customize a human Johnny. One flame that won't be so simple to remove is the giant plume on his head. Though the prototype figure showed a head sculpt that was impressive without being over-blown, the production sample does not carry that forward. Instead of a nice plain head with fiery eyes and a few hints of orange paint in the hair, we get a head that looks completely normal - except for the giant plume of cartoony orange anime hair. You look at the sculpt and you can see the difference between what's supposed to be hair and what's supposed to be fire, but the paint doesn't make that distinction. 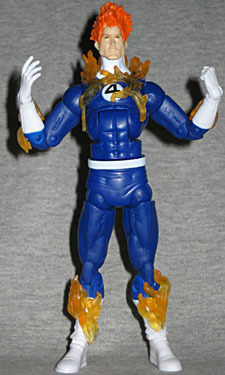 Instead, we get Super Saiyan Human Torch, and it looks stupid. I don't even think painting the "hair" sandy blonde would help, since the flame would still be solid orange. It doesn't even match the fire on the rest of him. Wow, terrible choice, guys. It almost seems unfair to say Johnny is 6½" tall, since a good chunk of that is his inexplicable conehead. Without it, he'd just top the 6" mark, which is a decent size. He uses a lot of the new Hasbro-style joints, but they're mixed in with the old ToyBiz style. He has a balljointed head, balljointed shoulders, swivel biceps, double elbows, balljointed wrists, a torso hinge and swivel waist, balljointed hips, swivel thighs, double knees and balljointed ankles. This is actually a good mixture of the joints - combining swivels at the hips and shoulders with double-hinged knees and elbows realy works better than Hasbro's all-purpose arm and leg balljoints. 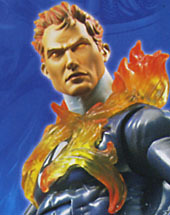 The Human Torch doesn't have any "torch-y" accessories, but that's fine - after all, what would they give him? This is a Build-A-Figure series, so Johnny has the left leg of the BAF, Ronan the Accuser. Ronan sure wears a big boot. 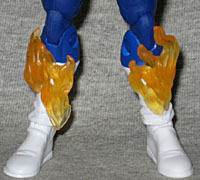 The leg has a double-hinged knee and a balljoint at the ankle. His lower leg is wrapped up in cloth, and he has three short silver spikes sticking out the sides. Ronan's leg reaches up to Johnny's waist - he's gonna be a big guy! Johnny is 90% of a good figure, but like Thing, he has a flaw keeping him from greatness. If not for the dumbass flamehair, this would have been a very nice Human Torch. Nice sculpt, just a little bit of flame, good articulation... all good stuff. But that head! Ugh! If they'd stuck with the head from the prototype, we could definitely recommend this figure, but as it is? The fact that he comes with a BAF piece is the only thing keeping him from being a pegwarmer.